I’ve found that one of the best ways to gain sewing confidence is by participating in sewing contests and sew-alongs. The idea for me is not to compete with others as much as I’m competing with myself (remember no pressure, right?) to improve my skills. I’ve also learned a lot from observing others and met some really wonderful people in the process. As we move into September, I thought I’d compile a list of sewing events around the NET to encourage you to step out and reveal some of those awesome creations that I know you have inside of you. Nothing ventured, nothing gained, right? Project Run and Play is one of my favorite contests for sewing kids clothing. They have a new contest every season where 8 contestants are given sewing challenges that they must complete. Readers are then given the opportunity to vote for their favorites and one contestant is let go. I enjoy this contest immensely because they have a sew-along and flickr group where you can upload your own interpretations. Both the contestants and the flickr groups are amazing. I would encourage anyone, whether a beginner or pro to take advantage of this fun-filled sewing opportunity. Want more info? 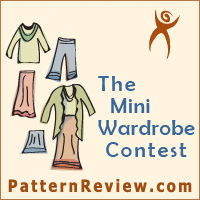 Here’s a link to the sew-along rules for the contest. Are you a quilting Diva extraordinaire? Rachel over at Family Ever After has put out an invitation for others to join her in the month of September for a Quilt Along. She includes a full step by step picture tutorial so you can join her in the process. Here’s a link to Rachel’s blog events by month . Did you know that September is National Sewing Month. (I didn’t. :-)) National Sewing Month is presented by the Sewing & Craft Alliance in partnership with the American Sewing Guild. They are offering a sewing contest that begins on September 1 and runs through September 30, 2012. You can sew anything you want, and winners will be chosen at random (Sounds pretty cool to me) Visit their website at nationalsewingmonth.org for more information. And last, but certainly not least is PatternReview.com. Patternreview is the first site I joined when I started taking sewing seriously some years back. You can join for free (or upgrade if you like) and participate in the contests, sewing forums, etc. There’s a wealth of information for the novice sewer up to the expert. Next month (September) they are running a Mini Wardrobe contest that’s sure to be an awesome challenge. What better way to practice your skills, right? So jump on over there and start working on that fall wardrobe! Here’s a link to their informative website. Just scroll down the left sidebar and look for “ALL CONTESTS”. What contests or sew-alongs are you participating in?